LOCATION.--Lat 39°45'39", long 74°06'38" referenced to North American Datum of 1983, Barnegat Light Borough, Ocean County, NJ, Hydrologic Unit 02040301, on bulkhead at U.S. Coast Guard Station in Barnegat Light, 0.5 mi southwest of Barnegat Inlet, and 4.4 mi east of Pebble Beach in Barnegat Township. PERIOD OF RECORD.--Annual maximum tide, water years 1965-1980. Unpublished fragmentary gage-height record, September 1997 to October 2000. Continuous-record tide gage, November 2000 to current year. GAGE.--Tide elevation, water temperature, precipitation, air temperature, relative humidity, air pressure, wind speed, and wind direction recorder with telemetry and tidal crest-stage gage. Datum of gage is at 0.00 ft NAVD of 1988. To determine approximate elevation in NGVD of 1929, add 1.26 ft.
EXTREMES FOR PERIOD OF RECORD.--Maximum elevation, 5.21 ft, Oct 29, 2012; minimum elevation, -4.25 ft, Mar 9, 2005, although a lower tide likely occurred during period of missing record on Feb 16, 2007. EXTREMES OUTSIDE PERIOD OF RECORD.--Maximum elevation, 4.93 ft, Dec 11, 1992, adjusted to present datum, from mark on discontinued tidal crest-stage gage. 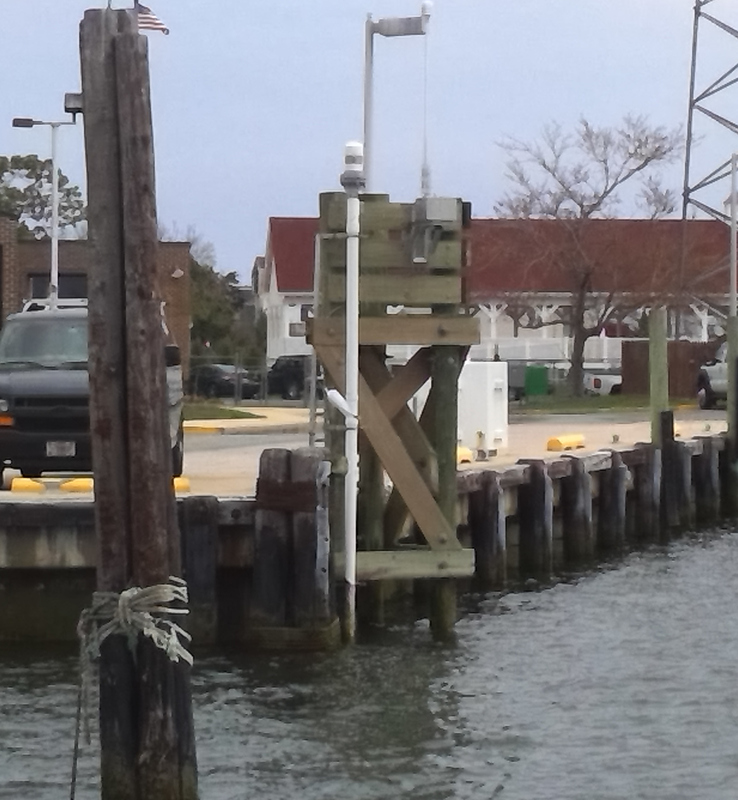 National Weather Service flood stage for this gage is 3.7 ft.
Water temperatures collected at this gage often reflect Atlantic Ocean water temperatures during incoming tides and Barnegat Bay water temperatures on outgoing tides.